The timescales for the changes have yet to be confirmed. The External Audit of the Community Council for the financial year 2017/2018 has now been completed - please click here. The Council's Annual Return and the Auditor's Report can be viewed on-line by clicking on 'Accounts' in the left hand menu. The Goetre Fawr Community Council held an open access engagement event for residents, on Wednesday 18 April 2018 at the Village Hall. The event was aimed at understanding what residents want to see ‘more of’ in the village and to encourage suggestions for potential improvements. Representatives from the Bridges Centre were asked to come along to provide advice on befriending, volunteering and transport. The County Councillor, Mr Jones, also attended. Over 50 people came along and made a variety of suggestions on issues that matter to them, which have been summarised in themes set out in the pie charts shown here. An action plan has been developed to identify where the Community Council can make a difference on some of the issues of most concern to residents i.e. around road safety and improving the environment. There are opportunities for individuals and groups to take forward some of the social and leisure activities that were favoured, in particular a film club/cinema night and education/classes. You can see the actions being taken, and progress made to date, by reading the action plan here. Residents expressed concern over difficulties encountered crossing the busy A4042 and parking issues in the Village. County Councillor Brian Jones agreed to take these concerns back to the County Council and Welsh Government. There was overwhelming support for the resiting of a post box and provision of a post office service. The Community Council will explore the feasibility of this with the relevant agency. There are a number of meeting spaces available in the village and the Community Council are actively encouraging the development of wider access to existing public spaces and facilities. The Community Council led the first ‘litter picking morning’ in the village on Saturday 28 April 2018. As a result of village social media coverage, the event attracted support from many parents and children, the Scouts, Community Garden and many residents who were keen to ‘tidy up’ our environment and get involved. The event was extremely well supported and it proved to be a great way to exercise! Sue Parkinson, Waste and Recycling Education and Awareness Officer at Monmouthshire County Council provided all the necessary tools, bags and safety jackets. There were over 40 bags of rubbish collected within the space of 2 hours. Equipment was provided to village groups for future use and it is hoped that this will be part of a regular wider village programme that will encourage individuals to take their litter home and not to spoil our clean streets and lanes. The current Superfast Broadband Cymru project came to an end on 31st December with c100+ properties in the Goetre Fawr ward currently no longer in scope for connection. Goetre Fawr Community Council is therefore working with Monmouthshire County Council to explore the possibility of extending the reach of superfast broadband (SFB) to these properties through the TV White Space project. The service provides households with SFB via a radio signal from one or a number of local transmitter(s) and residents can apply for a grant which covers the full cost of the installation at their property (but not the ongoing monthly subscription). An application for funds from the Rural Communities Development Fund needs to be made first, but if successful it is hoped that survey work could begin by the Summer / early Autumn. We will keep residents updated through the pages of the Usk & Raglan Diary, and of course via this news section. The two events recently held in the village halls attracted 80 people in total, who all found the training very interesting and informative. It is possible that another event will be run during the Summer. The Community Council now has five public access defibrillators (PADs) - you can see the locations here. 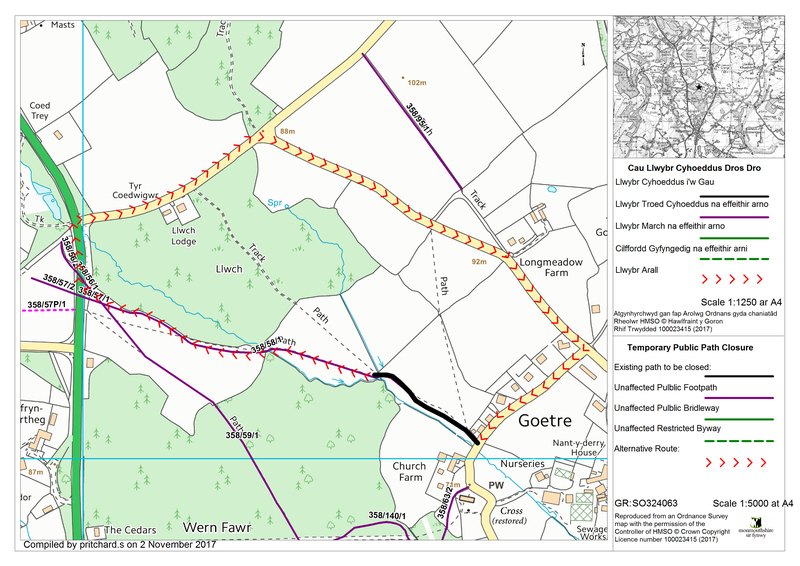 A new mains pipeline (about 6.6 kilometres long from Usk to Little Mill on the A472) is to be installed to replace the old aging metal pipework with new modern plastic pipework to improve the gas delivery quality. The work is due to start in January 2018 and will take about 9 months to complete. For anyone interested there will be a public information meeting from 1:00 pm until 7:00 pm on Tuesday 12th December 2017 at The Three Salmons Hotel, Bridge Street, Usk. Representatives from Monmouthshire County Council and WWU (Gas) will be at the meeting to answer any questions that anyone may wish to ask. Site plans of the works will also be available to view. All local residents will shortly be receiving letters detailing the works, and inviting them to the public information meeting. 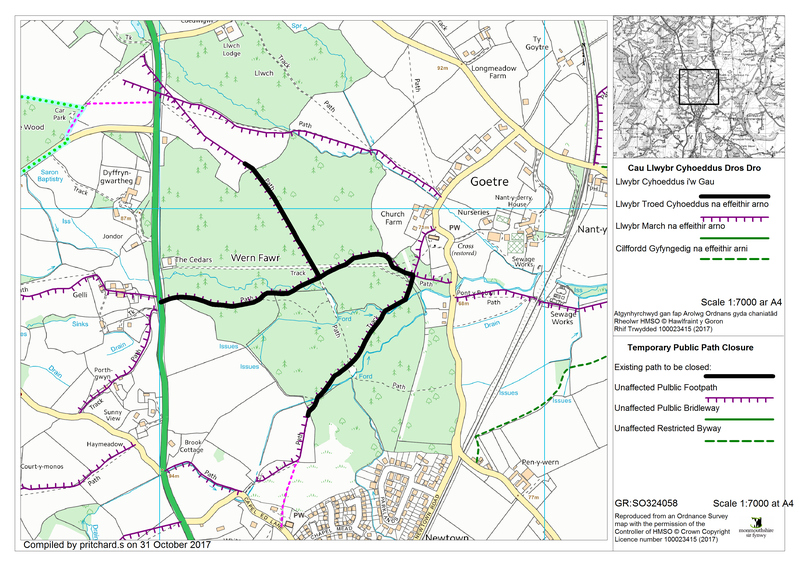 MONMOUTHSHIRE COUNTY COUNCIL is issuing an Order to close a small number of local footpaths for reasons of public safety due to the land being contaminated with oil - making it a danger to the public. The Order will come into force on the 23rd of November 2017. However the path by the brook adjacent to St Peters has already been closed by an emergency notice. The orders will remain in force for 6 months or until the works have been completed, (whichever is the earlier) and will prohibit traffic along the footpaths. An alternative route will be made available as part of the order. Please note that it is an offence to contravene the restriction. For further information please contact Monmouthshire County Council’s Rights of Way Section on 01633644850 or email Countryside@Monmouthshire.gov.uk.